(Newser) – David "Deacon" Jones, the original sackmaster, has died. The Hall of Fame defensive end credited with terming the word sack, for how he knocked down quarterbacks, was 74. The Washington Redskins said that Jones died of natural causes at his home in Southern California last night. 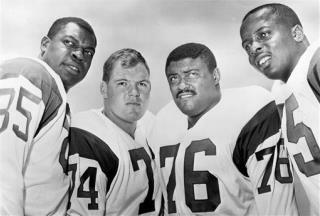 "Deacon Jones was one of the greatest players in NFL history," said Redskins general manager Bruce Allen, whose father, George, coached Jones with the Los Angeles Rams. "I will always consider him my big brother." Great player for a great defense back when the Rams played manly, outdoor football. Those blue and white helmets rocked it too. Rest in peace.